1.) How did the APRI GED Program help you pass the required tests? The APRI GED program did a fantastic job of preparing me for the GED Test. Their program provided me with evaluation tests, plenty of practice tests, and instructors that gave me the attention I needed to strengthen my academic weaknesses. My most valued lesson from this program was the importance of comprehension. Once I was willing to slow down and reread questions I had issues with, my results grew much more confident. 2.) How have you applied the knowledge you've learned? 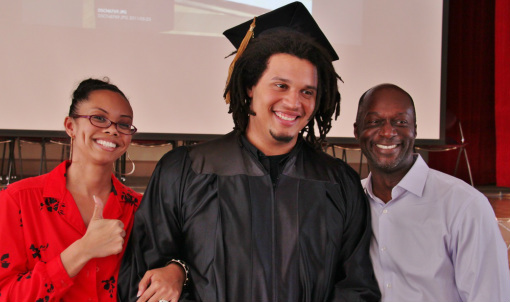 The GED was hard for me, because I lacked the follow through necessary to finish high school. Working with APRI, I realized how often I'd left things half finished. APRI gave me daily examples of how rewarding it was to be what James Bryant would call a "finisher." Someone who was true to their word. Someone I could rely on. 3.) What recommendations would you give to a new GED student? My advice to a returning high school student would be to dedicate yourself to the process. If you can keep yourself motivated, and manage to set aside enough time for yourself every day, you will pass. It’s also important to be humble. Having to learn fractions again isn't fun, but neither is realizing you forgot how to do them on test day. 4.) What was your favorite part of the process? For me, there was nothing sweeter than receiving the diploma. Knowing my mother was almost as proud as I was, was a close second. 5.) What are your plans now for the future? My goal is to go to a four year university so that I can learn how to support myself as an artist. I have proved to myself that I have the will power and follow through to graduate college. Now the time has come to do so. Read more about our CCSF van service.